Tom Perry wins heat four against Scunthorpe. Reserve ace Tom Perry has spoken of his delight at a fine start to his Panthers career. The winter capture has settled into the club’s number seven berth in fine style. Perry contributed a valuable 4+1 in his Panthers debut at Sheffield last Thursday and followed up with an impressive 8+2 the following night as Scunthorpe were demolished 64-26 at the East of England Showground. He had been on course for a paid maximum in his first home outing until having to settle for third place in his final ride in heat 14. Perry said: “Friday was a really good night for me, but it was a shame I couldn’t finish the paid maximum. “I’ve got to be happy with paid 10 in my first home meeting though and hopefully I can continue to score well. Perry has won back-to-back National League titles in the last two seasons, but he was quick to admit that returning to the second tier of the sport is a big challenge. He previously had a season-and-a-half at this level with Somerset until suffering a serious injury during the 2013 campaign. “I’m only 23 so I still have a lot to learn, but it has started well for me. “I’m not going to make any big targets. It is just a case of taking it one meeting at a time and hopefully doing enough to make it hard for the team manager to take me out of my last ride. 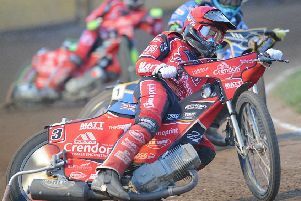 Perry’s final programmed outing went to bottom-end partner Emil Grondal at Sheffield as he had to settle for three outings, but he did have all four heats against Scunthorpe. “Tom should be very proud of the way he started the season,” said Panthers team manager Johnson. “To score a good number of points home and away is very pleasing.